Ever since the closure of The GoAnimate Complaints Department due to Happy Bunny's license expiring there's been something of a gap in social satire of GoAnimate Staff and member relationships. I honestly don't think any of GoAnimate's existing characters could replace Jim Benton's Happy Bunny on the Complaints Desk. Rather than try to do that, I thought, why not look at another area of the site that could use a little help. There's always been areas of customer service where GoAnimate staff could use a little help - usually because they're too busy making the site even more awesome behind the scenes. At the time Staff picks and how to get one was a big talking point on the GoAnimate Forums (Staff picks are always a talking point). 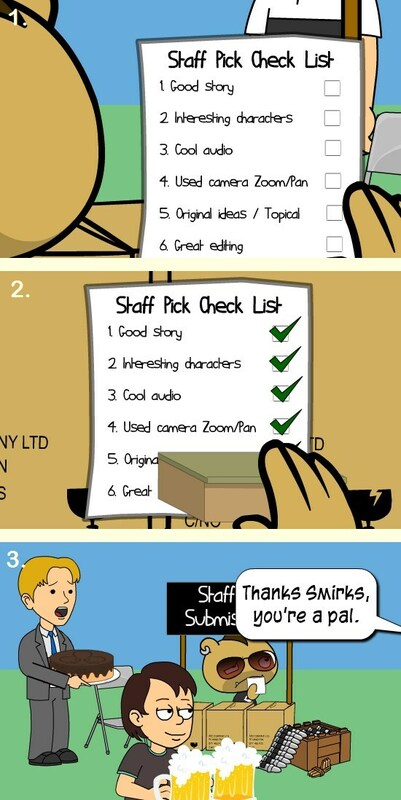 The biggest issue being how to get staff to actually view your animations. 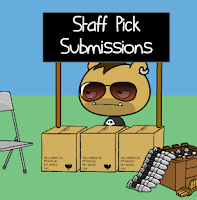 Thus I created the Staff Pick Submissions Department with Sid (Vicious?). I can't believe I released this over a month ago and I'm just writing about it in this blog now. When I published it at the beginning of February it was very topical. The whole issue of how GoAnimate staff picks were made was again a major talking point in the GoAnimate Forums. However you may be surprised to learn that I actually began work on this in October of 2012 - like I said, discussion of staff picks are always topical. It didn't actually take four months to make. I made a start on the animation in October with Syd's list and my initial idea of a certain, familiar, staff pick record holder bringing cake then left it as I got busy completing commissioned animations for GoBiz clients. Every so often I'd go back and tinker with it a bit more, until finally, in January, I made a concerted effort to gather more ideas and get it finished. Initially it wasn't going to be all about cake. That was just one of joke that I thought up for the record holder. But then I thought, what if everybody known to have multiple staff picks came with cake, until finally I arrive with cake only to miss out due to cake overload. Then I remembered a long running joke with fellow GoAnimator, gipsy, and his love of cake so I added that in too. With so many cake jokes it seemed natural to keep the theme going for most of the remaining jokes as well. This animation looks quite simple but there are a few things worth noting. Firstly it contains two new camera angles never seen in the previous Complaints Series. One an over the shoulder view from behind the desk where you see Syd lift up and read the Check List (see image 1. on the right). The second is a view directly above the desk where you see Syd stamp 'Approved' on the list (image 2). There is a scene where GoAnimator, Smirks, carries a couple of drinks across the screen from left to right (image 3). Notable because Comedy World characters don't have the actions to carry anything like this. I had to set the character's body up in a 'fearful' pose to get his arms in position then 'slide' him across the screen, so you can't see his legs, because, in this position, they aren't actually moving (it's a stationary pose). Finally you may have spotted that all the characters holding cakes have a prop arm - since Comedy World characters do not have this specific pose. The arms are made entirely from props (the hand is a prop too) using squares and circles to either construct a new arm or to mask out the characters original arm. Oh, in case you're wondering about that ambiguous box of ammunition... me too. It just seemed appropriate. Visit: gipsytips - bring cake. As usual, I really enjoyed the "behind the scenes". I think they are my favourite type of blog posts, since I always get new ideas, and make me focus on things otherwise I could have given for granted (like the look over the shoulder). Great blog entry, and may I confirm one important - critical point - of your post? 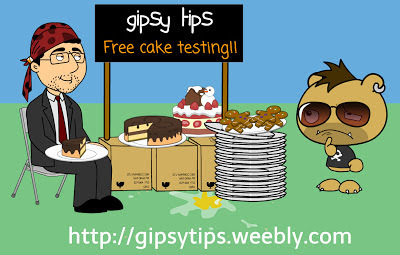 Bring cake when vistiting gipsytips.weebly.com!! !